Krishna Wilderness Retreat is a peaceful resort in Corbett with soothing ambience spread over 1.5 acres of land. This Resort in Corbett is situated right amidst Mango Orchard providing a unique opportunity to feel the bliss of Mother Nature, right up-close. You can hear the chirping of the birds early in the morning and feel the swaying breeze playing hide and seek between the Mango trees. In winters the Mango trees fill your vision to a verdant green. During summers when the Mango trees are in full bloom you might as well get to hear a bee humming the Nature song. 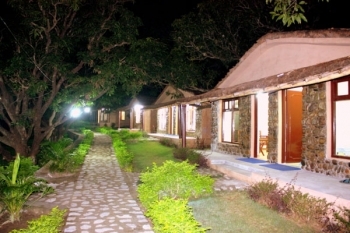 Krishna Resort in Corbett has luxury and deluxe cottages with all the amenties to make your stay comfortable. There is a multi cuisine restaurant in Krishna wilderness Retreat in Corbett National Park. The restaurant offers delicious Indian, Chinese and Mughlai food. Krishna wilderness Retreat resort is 270 kms from Delhi and can be reached easily by road. Road map to the resort from Delhi: Delhi - Hapur by pass - Gajraula - Moradabad by pass - From this point, where Moradabad by pass terminates, take U turn to left towards Moradabad city, travel 2 km, then take right turn - Kashipur - Corbett (Ramnagar). Road Map from Chandigarh/Ambala: Reaching resort from Chandigarh or Ambala 70 kms - Ponta Sahib 49 kms, Dehradun 46 kms, Rishikesh 27 Kms, Chilla 50 kms, Kotdwar 90 Kms, Corbett Krishna Resort.